Christmas may well be another 313 days away, but it is never too early to start making your own Christmas Cards. This year I'm trying to create lots of CAS (clean & simple) cards and this is one of the designs from my first Christmas Card Stamp A Stack. 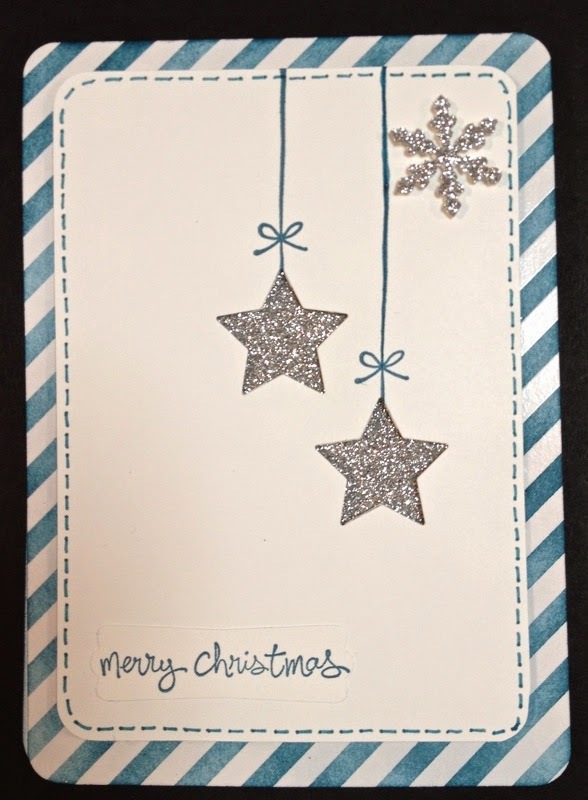 The background of the card is created by sponging Stampin' Up! 's Island Indigo Classic Ink over one of the patterns from the absolutely gorgeous Irresistibly Yours Speciality Designer Series Paper. The paper has an embossed design on one side - this one is diagonal stripes, and all you need to do is sponge colour then buff the page lightly with a tissue or soft paper towel. This will remove any excess ink on the raised pattern - in this case the diagonal lines. The stars can be positioned anywhere on the card when using the Stars Framelits and Magnetic Platform with your Big Shot, and this allows for lots of variation in your designs. I love this design and look forward to making more of these in a wide range of different colours. The Irresistibly Yours DSP is one of our Sale A Bration (SAB) free gifts. If you would like some, you can only get it with a $90 order. Then it is free! There are lots of other items to choose from so don't miss the opportunity - browse the SAB catalogue and contact me or place your order on-line. Don't forget to check out the Weekly Deals in the right hand side bar for some more great bargains.